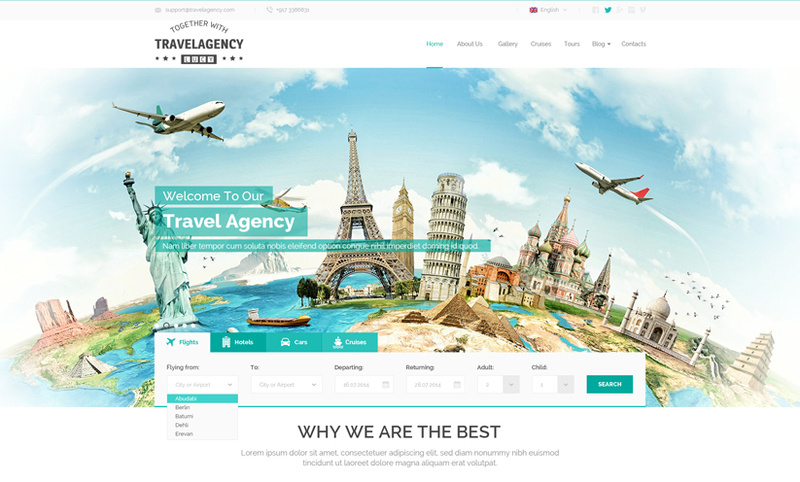 We are pleased to introduce our brand-new travel agency WordPress theme. First and foremost, it should be mentioned, that we already have a Bootstrap version of this template, which is more popular among inexperienced users. Since Bootstrap is static, it has less functionality than this WordPress version, so if you are a beginner, than bootstrap should work just fine, but if you’re looking for something more, you’ve come to the right place. 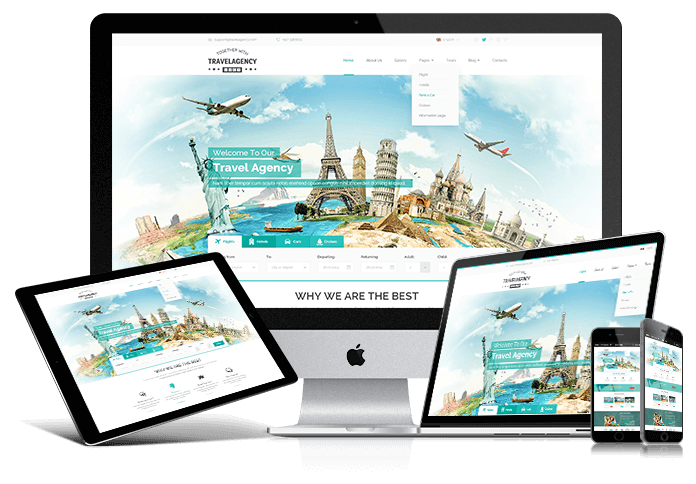 This is no ordinary theme, it is a fully functional travel (tourism) agency website. This kind of theme are very rare on any marketplace. Below I’ll try to explain step-by-step why exactly is this theme so special. Let’s start with the Homepage. As you can see, Homepage has a slideshow of different texts in front of the same image and below, it has a very special search box, which I will elaborate on in just a moment. Next are sections: “Why we are the best”, “popular cruises” and “happy customers”. “About us” has all the fields necessary for you to input all the information you want about your company and its staff. Of course, it has a Gallery page, since people will want an image to make sure they’re getting exactly what they wanted to get for the money they paid – tourism is all about the view. Each of these pages has that same search box I mentioned earlier, and that search box is what makes this website fully functional. The search box has 5 sections (you can add or remove any section according to your wishes). The sections it already has are completely enough to book a tour and plan everything your customers will need without leaving the comfort of their home. This website offers them the same service of a travel agency that most people are rightfully too lazy to go to. For users, using this box and looking for a specific hotel or flight or a car is fairly simple. They just have to choose from the drop-down menu of each category and they will get everything that matches their search details. For administrators, it’s a bit different. Everything that your customers can find, is uploaded by you as a product. Let’s take hotels’ page as an example. If you click on hotels from pages’ drop-down menu you’ll go to a page with the same search box and a list of all the hotels your travel agency is connected with. So, if your agency has a special contract with, for instance a hotel in Paris, that you have booked certain rooms in, at certain time periods for your customers, you get to upload that info along with prices and other details about room types on this page, so the people who search for hotels in Paris at that time frame can reserve the rooms for themselves. The same thing goes on with car rentals and Cruises. Your customer picks location/locations and start/end dates and the system will show them what’s available. Tours are a bit different and a bit simpler. They are “assembled” by the tour agency itself and uploaded, not with certain start/end dates, but with number of days. If a customer chooses time periods, as a result he/she will get anything that matches that vast time period. So, if they choose e.g. 2 weeks between their dates, they might get something that matches for less than 2 weeks (but in that time period). To avoid this, tours’ search box allows them to choose start date and the number of days they want to spend abroad. Every date that is not up to you as an agency, is fixed and determined but tour dates can be chosen exactly like your customers want. Flights section is somewhat different, since it can’t display all the available flights on all available airlines by itself. If your agency has already booked or purchased tickets, only then you can add them as a product on your website. This template also has a blog section and contact page, with all the necessary contact information and a working contact form. If anything here was unclear and you need any help after purchasing this theme, feel free to request any kind of help in the COMMENTS section above, and our team will not only reply, but make a special video tutorial if needed. Gridgum offers life support service to anyone who purchases one of our templates or themes, so if you are having trouble figuring something out, leave a comment and you will get a step-by-step video tutorial explaining everything thoroughly.